The Coen brothers ambitiously set out to prove something in their latest feature, "The Man Who Wasn't There," but I'll be damned if I know what. The movie is one of their most ambiguous, subtle and unrewarding endeavors to date, and the fact that it adopts the most visually attractive and nostalgic style seen in a picture this year only fuels the obvious issue, which is that "Fargo" is their masterpiece and lightning will likely not strike in the same place twice. The movie stars Billy Bob Thornton as Ed Crane, a local barber who lives the standard middle-class life in a town where no one ever seems to acknowledge his presence. His wife, Doris (Frances McDormand) is a relatively reserved woman who, when she's not working at the local furniture store, spends the most of her time playing Bingo at church. Ed's seeming obsoleteness is even apparent in Doris' attitude, so much so that she seems to take a liking to her boss Big Dave, and Ed quickly notices. One day at work, Ed meets an out-of-town businessman with aspirations of building an empire on a new (but perhaps revolutionary) idea: that of dry-cleaning service. Ed is spurred by the concept and decides he wants to be part of the cause. The businessman offers to make him a partner, but the deal has to be reached via a contribution of $10,000 on Mr. Crane's part. So where does an average American man like Ed get his hands on so much money? By pretending to be an outside source, he blackmails Big Dave for the money, insisting that if he doesn't pay up, he will expose his affair with Doris to the public, thereby ruining his public reputation. Ed succeeds in pulling off the scheme, but eventually Dave catches on to the barber's deception and confronts him. During a tense struggle that involves lots of punches and broken glass, Ed grabs the nearest sharp object he can find and murders Dave. The resulting outcome, unfortunately, has Doris being arrested for his crime. As the story progresses, it becomes even more obvious about how many opportunities are missed with "The Man Who Wasn't There." 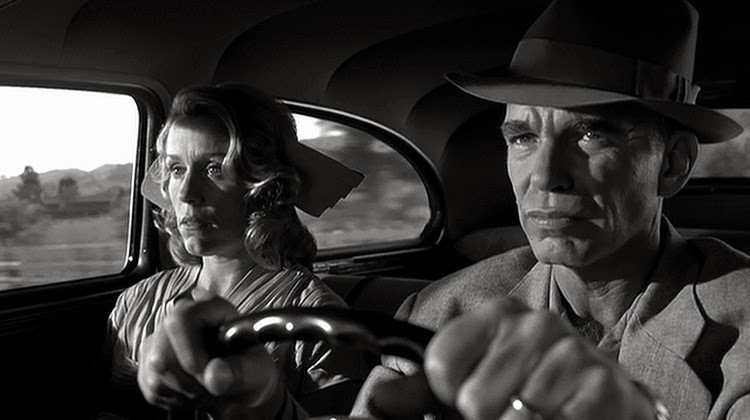 The picture has every notable touch of film noir down to a science, from the barely lit and smoky hallways to the sheer obscurity of the characters' human emotions. Even Thornton and McDormand, two extraordinary actors, have the facial structures and attitudes seemingly made for this period of storytelling, and the use of Ed as a semi-narrator to the audience is spot on. Yet the Coens' screenplay is a mash of ideas and metaphors that never quite manage to gel. Aside from the fact that they don't provide clear themes for us to explore (the movie even tries, in a rather disjointed way, to describe the process of cutting hair as a metaphor for life), they begin their story in a subtle manner and refuse to pick up the pace until after all the majority of the crucial events have played out. It isn't until the final 20 minutes when we are able to throw back our heads be amazed by what is happening. I will even go further to say that there is one moment briefly before the resolution in which we are delivered an unexpected, jolting but masterfully executed plot twist that temporarily renews our excitement. The biggest mistake, above all others, is the script's inability to create a sense of admiration towards the main character. As Ed's story unfolds, we feel no sympathy or connection to him whatsoever; the alienation he experiences in life is undoubtedly reflected on many of us, but there appears to be little effort on his part to make a difference until after it's too late. Ed may be very well be the man who wasn't there, but that's not the only thing absent from this letdown of a motion picture.